All you require from a financier is a reply to your development finance application; approved or not approved; yes or no; that's it. To achieve that positive outcome you must give them all the information that allows them to make a decision. Unfortunately many applications lack this information and result in a worst case scenario, of rejection and at best in long and frustrating delays. What that means is the lender has a very narrow area of interest. As a developer you may be upset to find out that the financier is not all that interested in how beautiful the development looks or the beautiful description of the ambience you will create in the residence. Don't be upset. They have a very limited field of interest and it is all to do with security; Their security - not yours. You need to know what it takes to make the banker feel secure and include all that information in your finance application for development funding. It is your job to give then all the information they require in order to make a decision. That’s It. Perhaps you should read that sentence again. To make a decision they do not need you to rhapsodize for pages about how you met an old friend who stumbled across this land one day while walking the dog … how your aunt encouraged you from youth to become a developer … you inherited the land or cash or both; whatever. Nor do they need you to write pages of descriptive prose on how magnificent your development is, with its beautiful this or unique that. In fact, going over the top in this descriptive way is really a sign of an amateur. Essentially there are only two things a banks looks at when you make a finance application for a loan to develop a new project. The first is YOU; The second is Your Development Proposal. Forget any idea you may have about a personal relationship you think you may have with a bank manager. You don't, he is just the guy you have a beer with once a week. The local bank manager has no influence on the approval process for your development finance application. 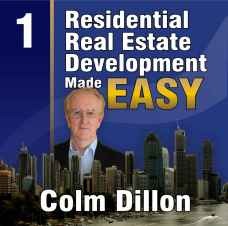 In fact if you study my course, you'll be told why it is a massive mistake for you to even tell him/her you intend doing real estate development. His/her power was removed years ago as the lenders' security measures; he/she were just too embarrassed to tell you. The first thing the lender is interested in seeing is your CRA and they can locate that with the click of a key on a computer and the Credit Bureau will spit out your credit history. So before you even start thinking about getting into development; it is a good idea to get a copy of this report and make sure it has a good clean profile. To encourage you to investigate te status of your credit, how would you like to get to the point of lodging a development finance application, only to be told that you failed because of a bad report on an account you paid years ago, but was late in paying. Yes, it was that phone bill you had a problem paying, but finally did pay it. Only problem is the bad report was never removed from your credit report. This is where they look at all the facts and figures you have compiled. It is important for you to understand that I want to distinguish between the piles of bank papers you have to fill in, when making an application AND what I call your development finance application. The bank's papers are only their internal procedures of form filing; we all have to do that. The application I am talking about is the one I will teach you how to prepare and present in my course. My application concentrates only on the facts that a banker needs in order to make a decision to give you the loan or not. In fact, when my application is completed and lodged, there are no questions a banker needs to ask to make a decision, it is so precise. In fact, my application just requires you to fill in the figures, because most of the descriptive material is included and only need modification to reflect the features of your development. Now let's get back from the finance application to the rest of the package that makes you a real developer.